You must be an administrator to enable this call forwarding configuration. If you are not, you must ask your Toky account administrator. 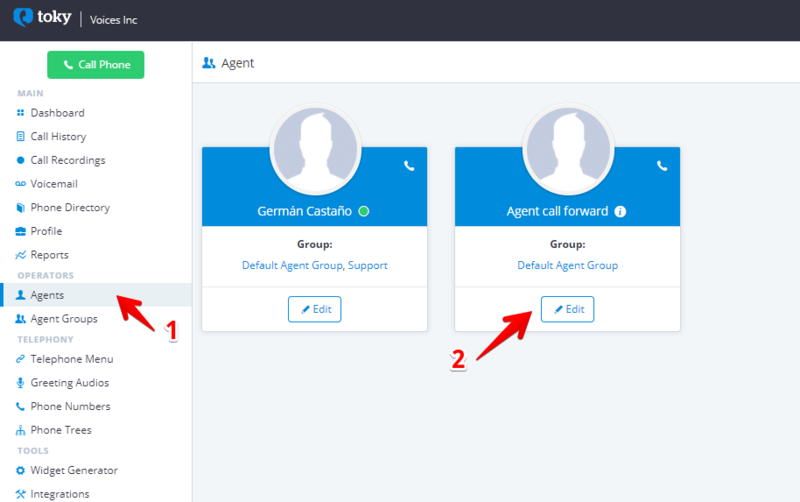 If you do not want to be available to answer calls by internet either from in your computer or smartphone, you can enable permanent call forwarding. In Public profile insert the Phone number where you want the calls to be forwarded. By enabling this option you'll stop receiving calls using Toky's website, web browser or mobile phone apps and you must have available credit.. Locate the agent and click on his Edit button to open the Edit Agent window.